Beaver Island gained notoriety as the eight year kingdom of James Jesse Strang, a battleground between Mormons and Irish fishermen, and a pirate lair. Documents, newspaper accounts, and legends reveal facets of Beaver Island’s fascinating and controversial history. Newspapers and other documents reveal a contradictory and controversial James Strang, and his eight year reign as King of Beaver Island. Conflicting accounts portray him as the founder of the Strangite sect of Mormonism, a capable journalist, a talented legislator, and a charismatic molder of people and public opinion. Other accounts flatly state that James Strang was a pirate captain, and a murderer and a thief. Beaver Island a Hotbed of Mormon Pirates? The old sailor said that the followers of Joe Smith, the Mormon, lived on Beaver Island, Lake Michigan, and that in midsummer several ships and their crews had disappeared around Beaver Island and were never heard from again. According to the old sailor, Mormons boarded becalmed vessels, murdered their crews, discharged the cargoes on Beaver Island and burned or scuttled the ships. He said that sailors found iron of a kind only used aboard vessels, and pork and beef barrel heads of a kind that Mormons never bought on the Island. He said law enforcement officials and island residents tried to capture the criminals, but they didn’t have enough proof to implicate anyone. Between tobacco chews, the old sailor told the young fellows that in the fall of 1849, he had embarked on a brig from Buffalo to Chicago. As they neared the Beavers they caught a stiff and hard breeze from northward and although he thought the ship could outrun the stiff breeze, it stirred up enormous waves that washed over their ship. Late that afternoon the wind still held, the sky threatened snow, and the captain of the ship decided to take shelter under the Beavers until the storm had blown itself out. The captain of the brig pulled up on the lee side, dropped the anchors, and furled the canvas. The captain appointed watches with Jack Stevens the first watchman, and the rest of crew retired to their bunks. About eight bells – midnight-Jack Stevens shouted so loud that he might have been heard in Green Bay. The old tar said that when he and the other sailors heard the mate, a big brawny fellow with a sledge hammer fist, order them on deck, they sprang out of bed and ran on deck. When the sailors reached the deck, they saw by observing the lights in the houses belonging to the Mormons onshore, that the brig fast approached the beach. Two of the sailors, one the narrator of the story – swiftly ran up the fore rigging and rigged the sails so that the brig clawed off the shore like a startled duck making for a safe haven in the middle of a pond. The sailors investigated the reason the brig had gone ashore and discovered that both chains from the windlass to the hawser pipes were not taut as they should have been and their ends were lying on the deck. When they pulled the ends of the chain inboard, the sailors discovered that both chains had been cut not far from the bow with a steel saw as cleanly as if the links had been snapped apart. The old sailor said that “it was evident that the Mormons had been at work” and if Jack Stevens had not discovered the sabotaging of the ship it would have gone ashore and the entire crew murdered. The entire crew stood watch until morning and then the captain lowered the yawl and went ashore to see if he could find the anchors. According to the old sailor, the captain saw by the faces of the ‘Latter Day Saints’ that they were disappointed that the crew had lived to discover the saw cut chains and the missing anchors. The captain couldn’t locate the missing anchors, so he returned to his brig and he and his crew sailed safely away from Beaver Island. The next season while he sailed on a schooner from Ashtabula, the old sailor saw the same two anchors the brig had lost the season before at the Beavers. He talked to the captain about the anchors and the captain said that he had bought the anchors from the Mormons that spring. The old sailor could positively identify the anchors because he knew them by the marks that his shipmate, Tom Jones, had made while he sat on them spinning yarns. A bouncing big fellow, Tom Jones sat on the anchors so much that he marked them with hearts – canvas hearts he had sewed on the seat of his trousers. Several newspapers including the Allegheny Record, the Brooklyn Eagle, and the New York Times picked up a story from an Allegan newspaper that converted some of the rumors about the Mormon pirates into stark black newsprint. The story, carrying dates from October 7, 1855, to October 12, 1855, said that people from Lake Michigan from Grand Haven in west Michigan to the Manistee River at Manistee further north, were in an uproar because a gang of marauding pirates. The marauders, reported to be Mormons from Beaver Island, operated more boldly than any other highwaymen on record. The pirate gang reportedly burned sawmills, and robbed stores north of the Grand River. The pirates tried repeatedly to break into stores and shops at Grand Haven. Then they sailed to the mouth of the Kalamazoo River and after looking around, they voyaged south as far as the tanneries in the town of Ganges. On Saturday night they broke into Robins & Plummer’s Store, robbed them of $1,600 worth of goods, and retreated down Lake Michigan. Robinson and Plumber pursued the pirates as far north as Grand Haven and then turned back, because the Grand Haven people advised them that it would be useless and unsafe to pursue them further without an army of hundreds of men. A story in the New York Times datelined Sault Ste. Marie, Michigan, January 4, 1907, reported that the partially burned Eclipse, the vessel of Pirate King Strang of Beaver Island, had been found in the sands of Beaver Island. State officers had captured the Eclipse after a bloody fight in 1855, and set it on fire. Many of Strang’s pirates were killed in the fight. The New York Times said that Captain Strang and his pirate crew would ambush ships that passed Beaver Island and either murder the sailors or take them as prisoners to Beaver Island and force them to become Mormons. Beaver Island residents uncovered many skeletal remains of victims of the pirate band and they found many old hulls of ships that Strang and his men destroyed. James Strange- Destined for Greatness or Disrepute? James Jesse Strang began his life as an ordinary man with extraordinary dreams. Born on March 21, 1813, in Scipio, New York, he suffered delicate health from a young age. His mother treated James, the second of her three children, with care because of his health, but she required him to give an accounting of his behavior and this requirement made James appreciate record keeping and writing at an early age. He wrote in his autobiography that he attended grade school until age twelve, but his health prevented attentive study or steady attendance. He estimated that he spent a total of six months attending school. He also became a Baptist at age twelve. James kept an extensive diary written partially in a secret code that his grandson Mark Strang deciphered one hundred years later. In his diary Strang noted that “my mind has always been filled with dreams of royalty and power,” and he lamented that by age nineteen he wasn’t a general or a state legislator. At age 23, James Strang was admitted to the New York Bar, after completing law studies on his own. He practiced law at Chautauqua, New York, after he married and moved there with his wife Mary, and he developed into a silver tongued orator and excellent debater. He accepted a position as county postmaster and edited the Randolph Herald, a local newspaper. He served as a Baptist minister for a short time, but he left in February 1844 to join the Church of Jesus Christ of Latter Day Saints – the Mormon Church. Joseph Smith, founder of the Church, took a great liking to James Strang personally baptized him, and ordained him an Elder. Then Joseph Smith sent Elder Strang to establish a Mormon congregation at Voree, Wisconsin, near Burlington. On June 27, 1844, a mob killed Joseph Smith and his brother Hyrum at a jail in Carthage, Illinois. After Joseph Smith’s death, James Strang produced a letter that Smith had supposedly written, proclaiming that Strang was his successor. Unfortunately for Strang, he claimed church leadership the same time as Brigham Young, and Brigham Young ultimately won the battle. He excommunicated Strang and took most of the Mormon believers to Utah. The Mormons who stayed with Strang did so mostly because he adamantly opposed the doctrines of plural marriage that the Utah- bound Mormons embraced. Claiming Divine guidance, Strang and his followers migrated from Wisconsin to Beaver Island, Michigan. In June 1848, a steamer carrying Strang and 25 of his followers landed on Beaver Island. Before “St. James Harbor” froze for the season, 100 more of his followers had arrived. 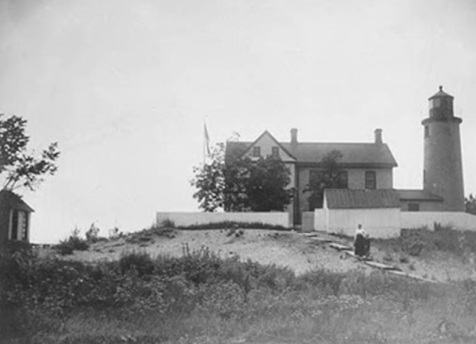 Life on Beaver Island solidfied James Strang’s political and personal ambitions. Even though he had advocated strongly against polygamy, he did an about face and in 1849, he secretly took Elvira Field who had traveled with him disguised as man called Charles Douglas, as his second wife. Altogether, Strang married five wives and fathered fourteen children. On July 8, 1850, about 235 followers of James Strang crowned him “King of the Kingdom of God on Earth” in the large log tabernacle they had built. The ceremony featured a crown, a red royal robe, a shield, breastplate, and a wooden scepter. King James claimed to only be King of the Mormons, but he tried to force the gentiles- the name he and his followers gave non-Mormons- to pay tithes. The gentiles, mostly fishermen who had called Beaver Island home long before the arrival of the Mormons, refused to pay tithes or taxes. Rumor had it that the Mormons dragged many of the fishermen into the woods and flogged them to make them feel more generous. Strang also ordered the County Treasurer to give the Mormons one tenth of the taxes collected on the Island, an order that the gentiles adamantly opposed. The Mormons and the gentiles were constantly at war with each other. Rough necks at the post office beat Mormons and Strang fired a cannon at a group of drunken fishermen threatening to drive his people off Beaver Island. Strang and his fellow Mormons eventually monopolized local government, blurring the line between church and state. James Strang and his followers transformed Beaver Island in other ways. They built a log temple and a saw mill to provide lumber to build houses for the growing number of Mormons immigrating to the island. They built roads and cleared and cultivated the ground. Strang bought a commercial boat and vied with the local fisherman to control the bountiful fishing grounds. He founded a newspaper that he called The Northern Islander, and he published books and pamphlets explaining and defending his coronation as King. The Mormon population explosion in this remote and sparsely populated part of Michigan’s North Country gave them a loud political voice. By 1851, Strang and his followers had managed to capture most of the political offices on nearby Mackinac Island which was a judicial and electoral unit with Beaver Island and its neighboring islands. Confrontations between the gentiles and Mormons on Beaver Island continued to escalate and King Strang’s unconventional ideas made many people uneasy. Some sources say that word of the Michigan Mormon trouble reached President Millard Fillmore and he instructed the Attorney General of the United States to issue orders to the U.S. District Attorney of Michigan George Bates to prosecute Strang. In a possibly politically motivated about face, President Fillmore later cooperated with Brigham Young to facilitate the Mormon exodus to Utah Territory and even appointed him as governor of the Territory. The U.S. District Attorney of Michigan brought federal charges against James Strang including delaying the mail, cutting timber from public lands, tax irregularities and counterfeiting. District Attorney George Bates ordered the US Naval gunboat USS Michigan immediately sent to Beaver Island. The Michigan carried a United States Marshall, deputies and the district attorney with orders to arrest Strange and his followers and bring them to Detroit to stand trial in the Federal Court. The Michigan arrived in Detroit in May of 1851, carrying almost 100 of Strang’s followers. Judge Ross Wilkins set the trial date for June 1851, and the authorities made a deal to release all of the defendants on bail. The Deputy Clerk of the Court traveled to Beaver Island to depose all of the witnesses. The trial lasted from June 20 to July 10, 1851. James Strang, drawing on his legal past, acted as his own defense attorney. Against all expectations and odds, James Strang won the case. He victoriously led his followers back to his Beaver island Kingdom. His victory solidified his power base and his followers and friends garnered enough votes to elect James Strang a state representative from the Newaygo District in the 1852 election, and he won the position again in 1855. King James Strang had progressive ideas including conserving woodlands and soil conservation, but often instead of using his considerable persuasive powers, he issued edicts. One of the edicts he issued said that the Mormon women on Beaver Island had to wear bloomers. Two of the women refused to wear bloomers and Strang had their husbands flogged. In 1856, one of the flogged men- Thomas Bedford – was supposedly caught in bed with his business partner David Brown’s wife. A group of Strang’s followers seized Thomas Bedford and lashed him 79 times across his back. Bedford hotly resented Strang and his teachings and he freely shared his resentment. On June 16, 1856, the gunboat USS Michigan glided into the harbor at St. James – the town on Beaver Island named for James Strang- and Strang prepared to board the ship. As he walked down the dock, Thomas Bedford and several other men ambushed him and then ran to the ship. None of the officers or sailors aboard the USS Michigan attempted to help Strang. The USS Michigan steamed to Mackinac Island and the assassins disembarked without being arrested or ever being convicted of killing James Strang. The mortally wounded Strang and most of his followers set sail for Voree, Wisconsin, two days later and Strang died at Voree on July 9, 1856. After Strang died, mobs from Mackinac Island and St. Helena Island converged on Beaver Island and drove Strang’s followers- about 2,600 people- off the island and confiscated their property. Today the legacy of James Strang lives on in a print shop that the Mormons built during their eight year kingdom on Beaver Island that is now the Old Mormon Print Museum. His legacy lives in the controversies as old and enduring as Lake Michigan wind, waves and rip currents that swirl around his former kingdom. James J. Strang: Deciphered, Transcribed, Introduced, and Annotated. East Lansing: Michigan State University Press, 1961. Roger Van Noord. Assassination of a Michigan King: The Life of James Jesse Strang. University of Michigan Press, 1997. James Strang Book Charles Strang’s Book. A son of James.